This is definitely one of my go-to paleo recipes when I need to make something interesting for a potluck or other event, but it comes with disclaimers. 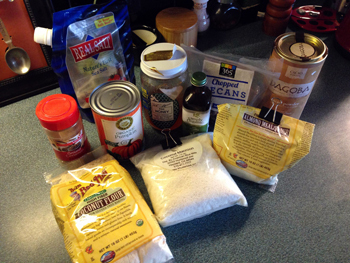 First, it is not a recipe I invented out of whole cloth, but rather something that I have adapted from a recipe I first found on Dr. William Davis’s Wheat Belly Blog, and which he originally got from a gluten-free cookbook called The Pure Kitchen by Hallie Klecker. I have been playing around with this recipe a bit over the last couple years, though, and have added some tweaks to it that I would like to share. In mixed company I sometimes refer to them as my “Nutty Paleo Balls,” but–depending on the company–that isn’t necessarily an improvement. In any event, on to the recipe! 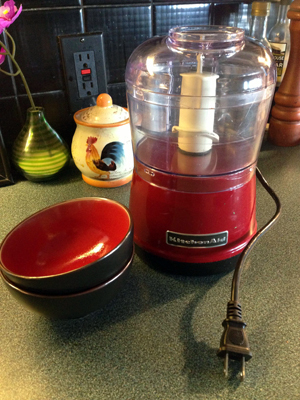 Remove the dough from the food processor and put into a bowl. Usually if I am making a big batch of balls I do a couple rounds of dough-making before I start the ball-making. Put the materials you are using for toppings into small bowls. 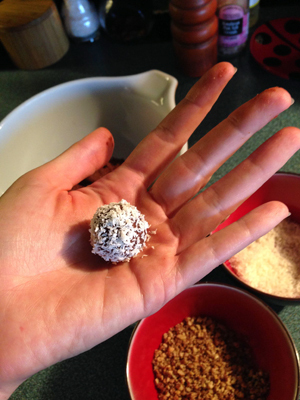 Pinch off pieces of the dough and roll in your hands to form a small ball. Your desired size might vary but I tend to make balls about an inch in diameter since this reminds me of chocolate truffles. Gently roll the ball in one (or both!) of the toppings until it is covered. Set aside. Repeat, alternating toppings as you desire, until all the balls are formed. 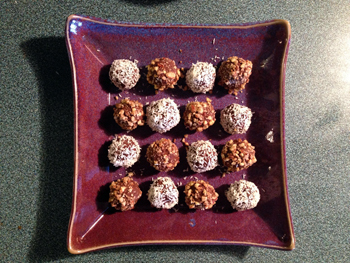 The proportions in this recipe made about twenty one-inch balls (some may have been eaten before the picture was taken). And that’s it! Nutty, chocolaty, and not overly-sweet, these have been a big hit with many non-paleo folk as well (although, APPARENTLY, my boyfriend is not one of them. Not that I’m bitter or anything). They are a sweet treat but are still very satisfying. When I have leftovers after a party, I often pop a couple over breakfast or have with tea as an afternoon snack. Last holiday season I made some little gift-sets with nine little balls boxed in origami boxes I made out of paper shopping bags (getting hella Martha Stewart up in here). There’s also a lot you can do with the toppings. 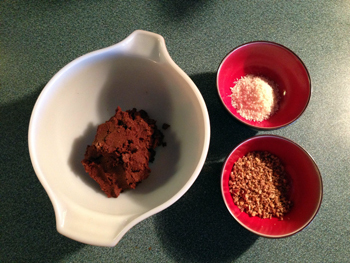 After I took these photos I realized an additional, third topping might be a mixture of cocoa powder and cinnamon, so I’ll probably try that next go-around. I hope you give them a try, and let me know in the comments if you come up with any new alterations of your own! The South Park reference got me and brought back some good memories. Also love the minimal use of sweetener. Right on. i don’t have any pumpkin so was thinking of apple puree – do you think it will work out the same? Possibly, it might be a little wetter and not as firm. 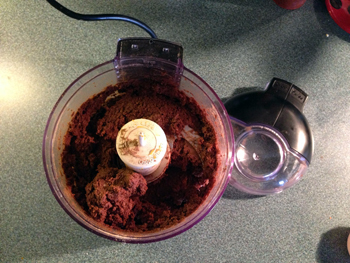 If it’s too wet, you might try adding more of the dry ingredients to help it get denser!